Today is Ganesh Chaturthi, an auspicious day in Indian calendar to offer prayers to Lord Ganesh. This day makes me nostalgic to remember the school days when we all assembled to celebrate Ganesh Chaturthi. 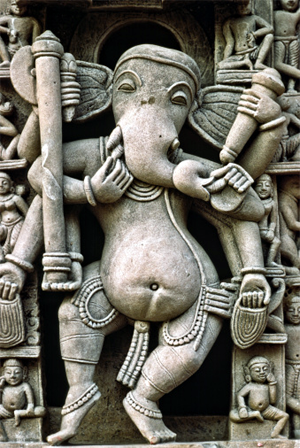 We were then aware that Ganesh is the lord of wisdom and learning. His birth was interesting, too. The story around him was the wit with which he outwitted his brother Kartikeya to win the ladoo by going three rounds around Lord Shiva and mother Parvati who represent to him the universe. We were then fond of new dress, a delicious feast after the puja and a cultural programme. As the days passed by I have gathered the greatness of this friendly lord. It appears to me that next to Lord Krishna, Ganesh is the most popular god followed by Lord Hanuman. In eight of his incarnations Lord Ganesh has eliminated eight demons: Matsarasur (demon of jealousy) as Vakratunda, Madasura (demon of vanity) as Ekdanta, Moho (attachment) as Mohadara, Lobha (greed) as Gajanana, Krodha (anger) as Lambodara, kama (desire) as Vikata, self-indulgence as Vakratunda and finally, ahankar (arrogance) as Dhumravarna. Is that not a great revealation? However, a close analysis will show that all these eight demons live within us. Therefore, earnest worship of Lord Ganesh will help us get rid of the dreadful attributes like envy, pride, greed, anger, desire and attachment. There is another important aspect in the worship of Lord Ganesh. We offer different kinds of fruits, often considered poisonous, leaves, even thorny ones, and wild flower, signifying environment-friendly nature of our Lord. Therefore, Lord Ganesh and his worship shall not only cleanse us, but thereby make a healthy society with elements of love, friendship, respect for each other, peace, non-violence and co-existence. The Lord inspires us to protect the fauna and flora, too. In light of this, let us welcome Lord Ganesh to our midst and worship him for the benefit of mankind and his environment. Happy Ganesh Chaturthi to all.